I’m a problem-solver. I spot problems and address them. This perspective has sometimes caused the people I’ve worked with to become discouraged when I pointed out the one part of their otherwise perfect work that needed improvement. These days I have a new approach. 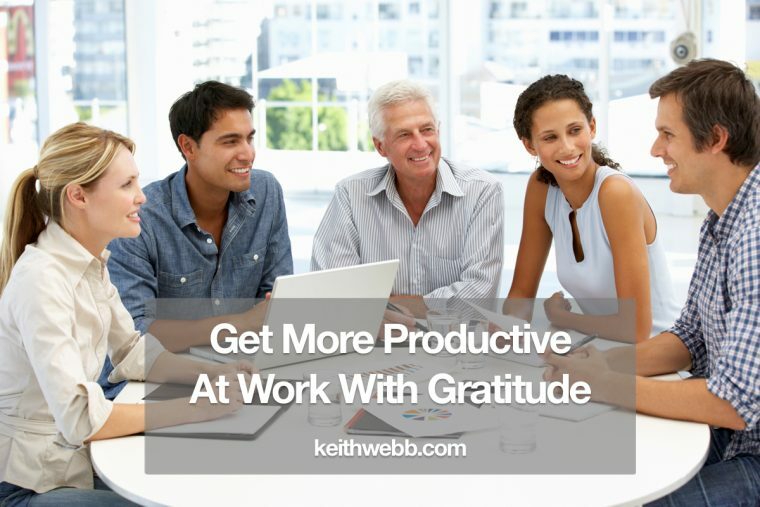 Here’s how to get more productive at work with gratitude. In my own work, I’m never done and it’s never good enough. I see what else needs to be done, fixed, or added. This attitude wears me out sometimes. What’s happening is our brains get stuck on whatever we focus on. If you focus on problems, then your brain gravitates to problems and produces emotions around those problems. Emotions like anxiety, fear, and sadness. The opposite has been proven to be true. If you focus on what you’re thankful for, then your brain spots those things and produces emotions like cheerfulness, optimism, and contentment. Practicing gratitude will make you happier and your team more productive. There are a number of ways to practice gratitude at work. It doesn’t need to take a lot of time. It’s mostly a shift in your focus from what isn’t working to what is working. Make a list. “Something as simple as writing down three things you’re grateful for every day for 21 days in a row significantly increases your level of optimism, and it holds for the next six months. The research is amazing,” Harvard researcher and author Shawn Achor told Inc.com. Tell people. Ken Blanchard, author of The One-Minute Manager, encourages managers to “catch someone doing something right.” Rather than taking for granted the things people do right, point it out and affirm them for doing it. Start meetings with gratitude. My meetings are usually about solving problems. Okay, that’s needed. But I’ve learned to start off meetings by sharing wins. Celebrate small wins. If birthdays and the $1m contract are the only things you celebrate, you’re missing opportunities to build up your team. Celebrating small wins encourages people to stay in the game and move forward. Look for a forward-moving metric, behavior, or attitude each month you can celebrate. Celebrate a forward-moving metric, behavior, or attitude every month to boost productivity. Say “thank you.” These two words are so powerful. People want your affirmation. They want to know the work they do matters. Saying “thank you” produces excellent dividends in terms of employee morale. Have fun with gratitude. Challenge your team to mention 2 things going well for each problem you tackle. You can make a change to your perspective by focusing on gratitude. Watch for the corresponding shift in the productivity of your team. Question: How do you show gratitude at work? You can leave a comment by clicking here.